Full Color, CMYK digitally printed graphics to attract attention. Includes ground spike for use outdoors. Lightweight & portable design for easy transport. 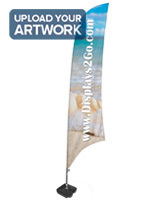 This custom bow flag offers a great way to advertise your company's products indoors and out. 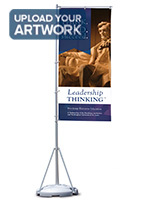 This blade banner stands about 13 feet tall and has a unique curved shape. 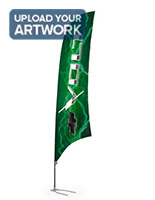 A flexible, fiberglass pole keeps the fabric taut and visible at all times, even in windy conditions. 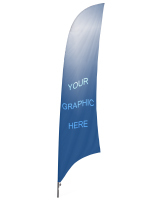 This custom bow flag, also known as an outdoor banner, comes with a ground spike designed specifically for outdoor use. Each unit is lightweight and portable, so setup takes just a few minutes. 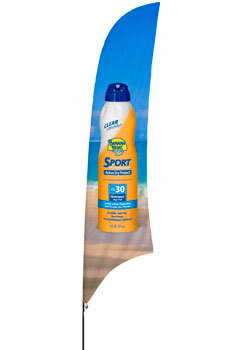 Customers can use this flying banner again and again at various events and sports tournaments. 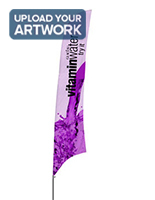 This customized bow flag is sold with full color, CMYK digitally printed graphics. Digital printing is perfect for quantities smaller than 10 units, as it does not require a minimum order quantity, like with a silk-screening process. 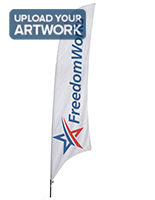 A digitally printed bow flag, such as the one seen here, is also a better choice for complex designs, photographic quality images, and artwork with gradients. Single-sided digital printing offers less color penetration as silk-screening, so that while graphics are visible on the back, they are not as vibrant as the front. This full color bow flag is printed onto one side only. Replacement graphics are also available. Pricing is based on single-image artwork. Orders placed for multiple images are subject to price correction.